Ordered truck 1/11/19. Took delivery of truck afternoon of 2/18/19. Live 25 miles from dealer. Half way home "check engine" light came on the instrument cluster and unnumbered oil pressure gauge was very low. Checked oil myself; it was at correct level. 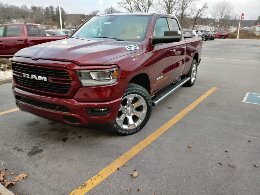 Returned truck next morning of 2/19/19 to dealer service shop. As of 3/2/19 dealer service techs did everything they knew to do and truck is not fixed. Techs have been in direct touch with Chrysler who suggested several fixes....none worked. I met with Sales & Service managers on 2/28/19 & they have no answers other than they are relying on Chrysler for suggestions to repair under warranty. I don't feel this is a warranty issue.....rather the dealer delivered a defective product.....the truck was obviously defective and it only took a few miles for the defect to be apparent.